This week I am thinking of three things: clouds, pockets and revelations. As a kid I watched “Bewitched” re-runs after school. Sometimes Samantha would join her mother in the clouds for a witch to witch conference. They would argue with each other completely oblivious to their surroundings. 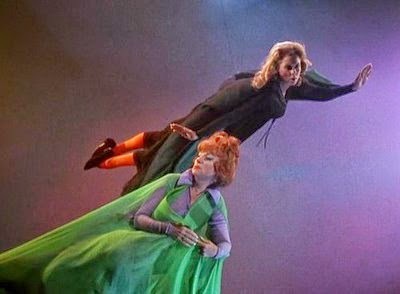 Apparently in that universe it was normal for witches to meet in the clouds. How wonderful to wiggle your nose and ride a cloud for an afternoon. Only one cloud in my sky this morning, and it looks good for riding. What does this world look like from that cloud, sitting higher than birds soar? Perspective is everything. Our planet is full, and getting fuller of people and we all have unique perspectives on the world, the neighborhood, the view of the lake, if Mrs. Green looks good in pink. We all have different points of view. How wonderful! What about your point of view on the life’s journey? Place random objects in a pillow case of different size and shape, such as a block, paperclip, action figure, rock, a string. One by one a child places their hand into the bag, selects one item and guessing what it is only by touch. It was a success! The kids seemed to enjoy it. I witnessed a man having a revelation, and it is haunting me. He is in his 70’s. The expression on his face was a moment of clarity. I saw it. It hit me hard. A true WOW. It was as if, for a second, the great mystery of life was revealed to him. It looked as if he could see his life unfolding before his eyes, the important parts floating by, and now he could see, NOW he knew who he was, what his life had been about all those years! It was as if he finished reading that one page from a long mystery novel when all is revealed! And at that moment I thought about the hidden objects in the pillow case and riding the clouds. I thought about clues hidden by life’s veil, a rock that we carry with us forever in our mind’s pocket, something we play with and touch, to see if it is still there, wondering the great wonder of what it is. A stone we get to hold and view ONE time. Written on the stone is our answer. Once we read it, we ride the clouds. Thoughtful piece, Shannon. Seems like those moments of insight, when the wave realizes it's actually the ocean, catch us when we're not looking for truth so much as observing what's in front of us…reaching into the pillow and not caring particularly what we'll find. That's when we encounter something wonderful. Happy Monday After Mother's Day! Thank you stilllifewithtortillas. I believe you read your message years ago and float on clouds daily, free and sure! So glad to have you in my life, writer sister.